Lucasfilm and visionary director J.J. Abrams join forces to take you back again to a galaxy far, far away as Star Wars returns to the big screen with Star Wars: The Force Awakens. 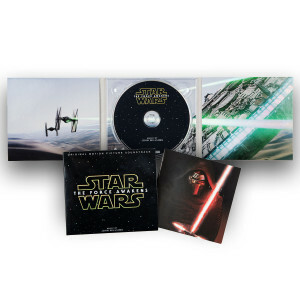 Make sure to experience the complete soundtrack by legendary, five-time Academy Award® winning composer, John Williams. Earn 50 Disney Movie Reward points with the purchase of this product. My son loves listening to this soundtrack, as well as his other Star Wars soundtracks when he goes to bed at night. We love these soundtracks! The Star Wars saga continues with the right composer behind it again. This score, which earned John Williams his 50th Oscar nomination, delivers in exactly the way one would expect from that galaxy far, far away. May the Force be with you, always.